John Adams has solved the central dilemma of modern classical music - how to be popular without selling out. The composers of the past whom we now revere as pioneers were all widely-admired in their time. Nowadays, though, musicians on the cutting edge alienate audiences and doom themselves to obscurity while our most fashionable creators often achieve success by copying their predecessors, pandering to pop taste and doing nothing to advance their art. Adams, though, manages to attract sophisticated musicians without upsetting listeners. He readily embraces the past even as he pushes the boundaries of the present. He's both novel and accessible. Adams was born in 1947 and raised in New England, where his father taught him music and they played together in bands and orchestras. In college at Harvard, Adams bridled against academic snobbery that, in his view, only served to perpetuate the narrow tastes of the professors and discourage innovation. Yet, at the same time he shied from brutally modern music that concert-goers couldn't understand or respond to emotionally. Influenced by John Cage and the humanist avant-garde and attracted by more open-minded attitudes, Adams moved to San Francisco, where he organized influential concerts of electronic and chance music. But, revealingly, he recalls that after such events he often went home to unwind with records of Beethoven quartets! Clearly, he was torn between modernism and tradition. He found a solution in minimalism. Pioneered by Steve Reich, Philip Glass and others, minimalism reorganized familiar elements to emphasize a steady background pulse, repetitive motifs and stable harmonic areas. To avoid the impersonal mechanics of such an approach, Adams added emotion, a blending of styles and a broad, architectural sweep. The result in his hands combined the intensity of serious classical music with the comfort of colloquial expression. The enthusiastic response of producers, artists and audiences has made Adams the most frequently performed of all living classical composers. Since 1985 Adams has enjoyed a symbiotic relationship with Nonesuch records: they release every work he creates and thus free him from marketing concerns, while he supervises each recording to ensure that it meets his exacting expectations. As a result, Adams has come to view his CDs as documents equal to his printed scores. Gnarly Buttons (1996) - Adams' most personal and cathartic work, Gnarly Buttons is a memorial tribute to his father, using the clarinet, his father's instrument, to trace and salute his father's pervasive influence upon his own life and career. It opens with the scales his father taught him to practice, and then alludes to Benny Goodman (whom his father revered), the marching bands and community orchestra in which they played together, and the emergence and development from such roots of Adams' own eclectic musical style. It ends with the confusion, pain and vulnerability of his father's final dementia (during which he became obsessed that someone was trying to steal his instruments) and a brief, peaceful elegy. A curious mélange when heard in the abstract, Gnarly Buttons becomes acutely poignant in context. Harmonium (1980) - Here's a great introduction to Adams' outlook and approach. It begins, significantly, with the layering of a chord, out of which a beat arises and expands to a massive climax, as if to proclaim a modern rebirth of music (and the foundation of Adams' own creativity) from the rudiments of the past. It's imbued throughout with the lush sound of late-Romantic choral works (especially Vaughn Williams' Sea Symphony) and the broad architectural sweep of Sibelius. The work itself is a setting of three poems - the lustful temptations of John Dunne's Negative Love are presented in tides of constant, propulsive motion; a sustained interlude of Emily Dickinson's Because I Could Not Stop for Death shimmers in repressed mystery and exquisite delicacy; and then Dickinson's Wild Nights emerges out of those intensely private mists - splashy, powerful and braying, ultimately exhausting itself and subsiding into a soft lulling pulse to reflect the poem's end afloat in the sea. The entire work is a striking synthesis of the traditional and the new, a confident blend of materials that sound at once original yet familiar, challenging yet comforting. 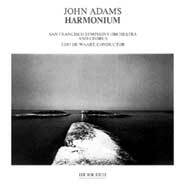 Harmonium neatly sums up Adams' aesthetic penchant and the reason for his broad appeal. Harmonielehre (1984) - Arnold Schoenberg's twelve-tone system polarized classical music for much of the 19th century. To some, it rescued the last century from the threat of languishing in uninspired imitation of stale forms of the past. For others, like Adams, the result robbed classical music of its intrinsic power, beauty and emotion, drove away audiences and forced modern music into a marginal role. Harmonielehre is Adams' poison-pen letter to Schoenberg and his legions of followers who dominated and hobbled classical music for most of the mid-1900s. In the first movement, huge pounding chords followed by a section of stasis clear the ears and then melt into a loving tribute to the expressionistic style of the late Romantics (including, ironically, Schoenberg's own early works). The second movement quotes the elegiac end of Mahler's Ninth, the very last of the great Romantic works, and evokes the wound of Amfortas that would never heal, symbolizing unrelieved melancholy as the entire orchestra, through constant descending chords, seems to be mourning and then anguishing over the overwhelming loss of the affecting music of a more meaningful time. The finale begins by casting aside the rancor of 12-tone progress to return to basics through a gentle berceuse, an innocent child's song inspired by Adams' infant daughter. After dwelling contentedly at this humble starting point of all human purpose, swells of clean, crisp energy surge forward to fuel massive orchestral fanfares that pound home a triumphant concluding message of renewed tonality, serving both as a deeply moving affirmation of musical tradition and as a signpost toward a more meaningful future. More effectively than any academic treatise, Adams argues forcefully that a return to real musical progress must begin with purification to purge the poison of the past century and then pick up at the point where the great classical traditions were left to languish. For Adams, music of genuine meaning for the future must set aside intellectual gamesmanship and draw freely on all the achievements of the past that are imbued with human feeling and meaning. Violin Concerto (1993) - A practical application of the aesthetic argument of Harmonielehre, this is Adams' only composition in a traditional form and combines time-honored structure with modern sensibility. As with the classic concerto model, the first movement is a far-reaching exploration complete with a solo cadenza. Dipping back further into musical history, the second movement is a probing chaconne and the last a fiery toccata. 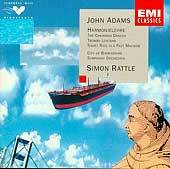 Adams' treatment of the violin, which he describes as singing throughout in a sort of hypermelody, is more novel. Indeed, the violin remains rather aloof, a somewhat disembodied observer floating over the orchestra with constantly evolving figurations. While this approach reflects modern music by lacking any sense of memorable tunes, it serves to unify the various dialects spoken by the orchestra and projects a sense of energy and invention across a wide range of emotions. the pernicious influences of American consumerism on high art ... where almost any and every artifact from my musical subconscious was allowed to float to the surface and encouraged to bloom. The piece could only have been conceived by someone who had grown up surrounded by the detritus of mid-twentieth-century recorded music. Beethoven and Rachmaninov soak in the same warm bath with Liberace, Wagner, the Supremes, Charles Ives and John Philip Sousa. I'd only add that while Adams makes his work sound like a disjointed musical garbage dump, it's really a smooth-flowing, heartfelt and respectful tribute to our polyglot American culture that somehow manages to meld its disparate elements together into a cohesive whole. Adams likens the experience to a long trip in which vastly different vistas slowly give way to others, but together are all part of a single wonderful journey. In essence, it throbs with an update of the same bold, unapologetic spirit as Ives' work, and is every bit as empowering and patriotic for our time as Ives' giddy patch-quilt of marches, hymns, fireworks, holidays and European classics was for his. From the pounding tympani and soaring sopranos of the opening, through the Copland-tinged open spaces of the middle, to the roiling Liberace arpeggios and grand climax on a theme of Wagner, Adams seems to suggest that it's all fine music and, more idealistically, that artificial historical and societal boundaries could crumble once we learn to love and enjoy it all together. 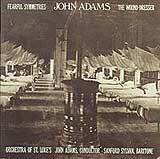 Fearful Symmetries (1989) - Adams views this piece as cut from the same cloth as Grand Pianola Music, but more tightly organized. It surely does tame the wild excess of that sprawling work, but manages to retain much of its breadth within narrower confines. In a way, it's a return to a basic minimalism, sustaining interest throughout its half-hour length by spicing its persistent perky beat with a constant evolution of syncopations, textural adjustments, melodic fragments and other neat little touches. Typical of Adams' mastery, it's an enticing blend of influences. Adams notes that its timbre mixes the weight and bravura of a big band with the glittering, synthetic sheen of techno pop and the facility and finesse of a symphony orchestra. The sound is of the brass- and synthesizer-dominated ensemble of Nixon in China and the symmetry of the title refers to the persistence of its regular pop phrase lengths. The constant fascination of its changing surface allied to its elemental rhythm has attracted the attention of a dozen choreographers and ballet companies. Common Tones in Simple Time (1979) - This was Adams' first orchestral work, and, in his view, his purest piece of minimalism. Intended as an idyllic landscape, a pastorale with pulse, it's consistently gentle and subtle as delicate figurations gradually appear, evolve and blend over a constant mellow background, creating sustained motion within a delicate expressive range, devoid of jarring transitions or emotional jolts. El Dorado (1991) - This companion piece expands the emotional range of Common Tones and adds a message of social activism as well. The first movement is intended to depict the corruption of the environment, as relentless abusive human consumption (the minimalist pulse, again) forces a bitter, militant climax. The contrasting second movement is uplifting and joyous, portraying a landscape without the human footprint, ... an Arcadian vision expressed in pure modal scales and harmonies, in which constant stirrings of life build toward a far more inviting climax, which then recedes back to its harmonious, elemental and still untainted beginnings. Two Fanfares - Tromba Lontana and Short Ride in a Fast Machine (1986) are a pair of complementary pieces that exploit the energetic implications of the minimalist pulse in the context of traditional fanfares. The first deliberately flouts expectations, its trumpets pushed into the background, generating a feeling of dreamy contemplation that only teases our anticipation of an outburst that never comes. With the second, those expectations burst to the fore. It's a furiously driven, outgoing depiction of a giddy and exhilarating but risky ride in a sports car pushing its mechanical limits and barely under control, beginning in the brass but then fueled by strings, winds and boiling tympani. Adams attributes its extroversion to the inspiration of Duke Ellington and Stan Kenton big-band arrangements. Perhaps it also serves as a fitting metaphor for America itself confidently hurtling headlong into the excitement and uncertainties of the next century. 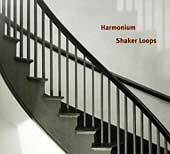 Shaker Loops (1978) is a further exploration of the uses of minimalist technique. According to Adams, the title has several connotations. Shaker refers not only to a fanciful fervent vision of the austere American religious sect that provides the atmosphere but also to the musical notion of shaking notes through trills and tremolos that pervade the texture. The loops of the title are small repeated melodic fragments that are as close as Adams ever got to the seminal minimalist technique of splicing short pieces of tape into endlessly repeatable sections. The dry mechanical precision of tape loops seem inimical to Adam's artistic urges and perhaps this was Adams' way of taking only an element of an impersonal technique he never fully embraced and applying it to a human perspective of live performance that was far more meaningful to him. Indeed, the frantic energy of the opening, which reflects the typical use of tape loops, quickly subsides into an extended section of sly calm. At one point the piece accelerates wildly out of control, and may suggest Adams' frustration with the limitations of a single-minded approach to an art that requires feeling to ripen into a meaningful experience. Indeed, the conclusion leavens the repetition of the loops with soothing harmonies as if to restore the traditional dimension. The piece originated as a quartet of long sequences of oscillating melodic cells, but as Adams shortened the patterns he thickened the texture, first into a septet and then into an arrangement for full string orchestra, the version he recorded. Christian Zeal and Activity (1973) - In his only other venture toward minimalist tape sampling pieces, Adams combines a hymn-like sound of elongated richly-harmonized chords with a seemingly unrelated tape of repeated phrases of a sermon on the power of faith healing (a bit like the effect of Simon and Garfunkel's Seven O'Clock News/Silent Night). Rather than to thoroughly deconstruct the verbiage into its constituent sounds, as Steve Reich might have done, Adams preserves the narrative sense though repetition of entire sentences and phrases. Perhaps the overlay of two seemingly independent events is intended to reflect two complementary aspects of belief - the specific instruction of the text and the eternal mystery of music. Nixon in China (1985-87) - The very notion of a minimalist grand opera seems a contradiction in terms, but Adams, in collaboration with director Peter Sellars and poet Alice Goodman, struck gold in his first outing, choosing as their subject President Nixon's historic visit to Communist China, arguably the most powerful event of the post-War era, symbolizing as it did the emergence of a new political and social world order. The result is a fascinating updating of the 300-year ceremonial opera tradition from Monteverdi to Puccini. The libretto brilliantly treads an uncomfortable line between the banality of the participants and the epic splendor of the occasion, with the ever-present minimalist pulse suggesting at once ritual and the deflation of pomp, anxiety and confidence, uncertainty and inevitability, isolation and continuity, all leavened with a constant sense of purpose and awe-struck wonderment over it all. Among the many highlights are a huge, thundering climax as the landing of the Nixon helicopter overpowers a mechanical mantra of workers' principles; a gorgeous aria for Pat Nixon who, momentarily freed from her earthy husband, glimpses the brink of eternity; a clash and mingling of cultures at a lavish banquet; and a surreal final act in which the exhausted leaders and wives meander through the tangle of history and their own psyches, Nixon (depicted throughout as a crude simpleton) jabbering on about his wartime service while the others search for meaning as their disparate dreams meld into transcendental poetic vision. The Chairman Dances (1985) is a corollary work, which Adams describes as an outtake from Nixon in China in which Mme. Mao was to have recalled her youth by dancing with an effigy of her husband as a respite from banquet protocol. In the tradition of ballets excised from earlier operas, it's a lovely piece that propels the overall feel and some thematic material from the opera into the realm of non-narrative fantasy. The Death of Klinghoffer (1990-91) - For their next project, Adams, Sellars and Goodman seized upon another headline event, in which Palestinian terrorists hijacked a cruise ship and murdered a disabled retired American Jew. Consistent with its heroic and idealistic vision, Nixon in China was clearly operatic, while Klinghoffer, equally appropriately, evokes religious music and suppresses the drama of the actual event in favor of meditation on its social and political significance. Much as in the great Bach masses, the most powerful music lies in eight choruses, with much of the action relegated to long, declamatory sections (which, in fairness, seem far less interesting on record than they might be on stage). The work begins with two long choruses (symbolically of exactly equal length) in which exiled Palestinians work up a militant fury to protest Israeli occupation, followed by exiled Jews, seeped in the patience of time, who garnish their land in historical inevitability. Despite that beginning that implies even-handed understanding of the societal forces that are to clash, the music, at least, develops far more sympathy for the victims than the perpetrators. Thus, the extraordinary lyric spell of the Aria of the Falling Body, sweetly sung by Klinghoffer's corpse in super-slow motion as it tumbles into the sea, is swaddled in lush accompaniment which ceases entirely when the murderer interrupts with his excuse. 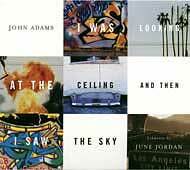 I Was Looking at the Ceiling and Then I Saw the Sky (1995) - Adams's third collaboration with Sellars produced two dozen songs for a Broadway-style show, a form which he had revered since childhood as the most American form of theatre. The intriguing title refers to the 1994 apocalyptic earthquake that could (but doesn't) change the lives of its seven characters. In retrospect, Adams seems saddened that his efforts fell short of the masters of pop, but for once I respectfully disagree. Several numbers are truly magnificent (and how many great shows boast more than a few?) - the title tune (repeated as a finale) is enticing, A Sermon on Romance catches the infectious spirit of a gospel romp, Song About the Bad Boys and the News shimmers with the beauty of a cappella women's voices (until it degenerates into a silly ode to lust) and Three Weeks has a killer melody that can haunt you for days. But the others, rather than being failures at pop writing, seem to me to transcend pop to strive for something far more ambitious - a catalog of the uses of the essential minimalist pulse to lend renewed structure and meaning to an overworked idiom in search of a fresh style. Thus the pulse is used to unify the characters' diverse thoughts in the ensemble opening number, to depict a slow reverie of cascading thoughts in Consuela's Dream, to underline the roiling emotions of an arrest in Mike's Song, to hint at persistent doubts about a boyfriend in Tiffany's Solo, to critique the mechanized system of justice in The On-Site Altercation, to suggest the desperation of a hopeless courtroom defense in Your Honor..., and so on. If the show is indeed a failure, the disappointment stems from two non-musical factors. The lyrics (I gotta get my disc to match your drive) by June Jordan are laughably trite and rarely rise even to the level of mediocrity - perhaps it's no coincidence that the show did much better in Europe, where audiences couldn't understand the banal words. And the cardboard characters, while intended to be a politically-correct mix of inner-city LA denizens, reads instead like a racist's fantasy - the Black men are a jailbird and a horny preacher, the Hispanic is an illegal immigrant and the Asian is a Vietnamese boat person turned inept attorney. (OK - to be fair whites don't do too well, either - the only ones are an airhead newscaster and an overbearing cop.) So perhaps the failure of Ceiling/Sky flows not from a lack of talent or effort. The song Three Weeks, seems emblematic - it proves Adams can write a great pop tune if he really wanted to, but even here he avoids blatant conformity and adds a personal touch by using overlapping 3- rather than 4-bar phrases. Rather, Ceiling/Sky strikes me as a conscious effort to get away from audience-pleasing hooks, cloying harmonies and other familiar Broadway trappings to attempt something far more significant - revitalizing pop with a new arsenal of minimalist tools and an aesthetic of which Adams is an undisputed master. The Wound-Dresser (1981) - Turning now from opera to song, Adams' most deeply disciplined piece reflects the monochromatic bleak mood and repressed emotion of Walt Whitman's experience as a Civil War nurse, wandering amid the aftermath of battlefield horror, trying to help but ultimately powerless to stave off suffering and death. As much stylized recital as singing, the open harmonies and parallel motion of the accompaniment suggest an emptiness and resignation that only once is overcome by a wave of revulsion. The text isn't pleasant - frankly, parts are downright disgusting - but Adams manages to surround it in an aural image of dignified tribute. Five Songs by Charles Ives (1989) - In an ultimate gesture of respect for a cultural forebear, Adams orchestrated the piano accompaniments to five of the magnificent songs written by Ives from 1915 to 1919. There's no attempt to improve them in any way; like a great literary translator, Adams merely extends appreciation for the originals to new audiences who might not be exposed to or understand the initial version. Ives' song output embraced a huge range, including marches (Circus March), patter (Memories), playfulness (Ann Street), the bizarre (The Cage), the powerful (From 'Paracelsus') and the monumental (Majority) but Adams didn't attempt to summarize the full realm of Ives' sprawling art. Instead he chose five songs (Thoreau, Down East, Cradle Song, At the River and Serenity) which form a nice suite of haunting calm and serene reflection. It's only one side of Ives, but a heartfelt evocation of an important influence. Hoodoo Zephyr (1992) - This work stands apart from Adams' others, as it was created in the studio rather than for live performance and thus isn't a score but the actual music itself. While this solves the problem of having to rely upon the limitations and individualistic quirks of performers and obviates the need to pay for expensive rehearsals and to attract audiences to specific concert venues, it also results in an immutable object that can dehumanize the experience we seek through interpretive art. Hoodo Zephyr is a suite of environments inspired by Adams' travels in the West. In the '70s, Adams taught himself electronics and built his own synthesizer, but this upshot isn't the weird mind-blowing stuff of electronic exotica. Rather, the sound is essentially acoustical emulations of percussion and other orchestral instruments but with sampled and synthetic touches. The result carefully blends elements to establish inviting atmospheres that transcend the sounds available in a concert hall and achieves a surprising degree of emotional resonance. Chamber Symphony (1992) - Despite the staid title, this is Adams' tribute to the energy and irrepressible spirit of cartoon music which, in a flash of inspiration (overhearing his son's TV program while he was studying a Schoenberg score), he came to equate with earlier attempts by serious composers to meld pop and jazz elements into classical form. The first movement (Mongrel Airs) emulates the lean, astringent wind-dominated textures of Stravinsky on the verge of neoclassicism, the second (Air With Walking Bass) delivers what the title describes, spiced with a constant overlay of teasing comment and detail, and the third (Roadrunner) hurls forward with relentless energy. As with so much of his work, it's a melding of pop culture fun and serious tradition that sounds forced in theory but great in realization. Lollapalooza (1995) - This is a pure fun piece, based on an insistent 5-note motif (C-C-C-long E flat-C) that sounds just like you pronounce the title. Dedicated to Adams' friend, conductor Simon Rattle and his City of Birmingham [England] Orchestra, it's an orchestral showcase bursting with infectious rhythm, rollicking humor and high spirits. Slominsky's Earbox (1996) - Another celebration of orchestral sound, inspired by the brilliant coloration and modal scales and harmonies that are a hallmark of Russian music. At the same time, it's a tribute to the wit and inexhaustible energy of centenarian Nicholas Slominsky, who compiled and championed the type of melodic patterns with which this work brims. It also slyly teases with Slominsky's wit and salutes his energy, as the sound of Stravinsky's Song of the Nightingale provides a rich harmonic loam that Adams showers with a huge number of motivic seeds that never manage to germinate into a genuine melody. John's Book of Alleged Dances (1994) - A tribute to the Kronos Quartet, who have worked tirelessly since the early 70s to commission and bring important new music to new audiences. According to Adams, the suite of eleven dances is only alleged because the steps have not yet been invented, but they're custom-tailored to the personalities of each of the four players. Overall, the suite reflects their edgy modernism, as their live music only barely intersects with an overlay of persistent prerecorded prepared piano rhythm loops. Although Kronos looks far more to non-Western art for inspiration than Adams, he clearly shares their basic outlook of respecting popular culture as a legitimate influence and contributor to modern serious music. Yet, perhaps out of respect for their leadership role, the sound is chromatic and the tone here is one of overall dignity. Eros Piano (1989) - Adams' most mellow work finds relaxed, gentle piano figures nestled contentedly in a deeply sympathetic orchestral bed in respectful tribute to the sensitive jazz stylings of Toru Takemetsu, Bill Evans and Paul Crossley. 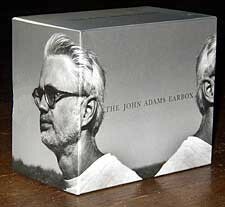 All of the works noted above are available (at least in excerpts) on the marvelous 1999 mid-priced 10-CD Earbox collection (Nonesuch 79453-2), enriched by Adams' cogent and insightful notes (to which my own comments are deeply indebted). 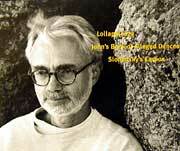 More information on Adams and his work is posted on his fine website.